Little Bits is a company that creates toys that are both fun and educational. In fact, they’re so fun to play with that you don’t automatically think that you’re actually learning the basic mechanics of engineering. I got a taste of Little Bits when I was just 8 years old and have been a bit fan since, although I must say that the parents may mistake the bright colours as something more suitable for younger kids. Actually, the inventors have made a colour coding system where each colour groups signify a particular function for the ‘bits’. For example, Green coded bits are output modules that allow you to change your surrounding, producing sound, light, movement etc. 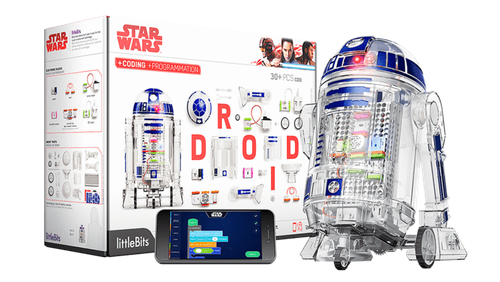 This Droid kit lets you give life and movement to R2D2 from Star Wars and deservingly won the 2018 Creative Toy of the Year. Who wouldn’t want one of these for Christmas? Suitable for kids young and old!